Introduction: Easing students’ transition to the clinical environment is vital in medical education. For anatomy, this can be achieved by incorporating medical imaging. Most resources for study of imaging solely cover structural identification, which does not adequately prepare students to interpret imaging in clinical practice. This resource adds to a series of tutorials incorporating clinical applications of anatomy. Methods: The tutorial was a self-administered PowerPoint that guided students through principles of abdominal anatomy. It integrated radiological images, including X-ray, computed tomography, and magnetic resonance imaging, plus clinical correlations and self-evaluation. It was evaluated as a review tool, using repeated-measures control/experimental design, on 100 Australian medical students in preclerkship years. Testing comprised knowledge-based questionnaires, a Likert self-efficacy scale, and open-ended evaluation questions. Results: Results suggest the tutorial significantly improved direct knowledge (p < .001), as the experimental group’s posttutorial test scores were superior for direct questions by 32% on average. This difference was particularly significant for short-answer and multiple-choice questions. Students’ confidence with anatomy and imaging was enhanced. Discussion: These results demonstrate the tutorial’s strength as a review resource. Unlike our previous work, where students received tutorials alongside anatomy teaching, this tutorial was assessed after coursework completion with similar results. Direct knowledge significantly improved; however, indirect applications did not, perhaps due to complexity of the region. Nonetheless, the results reinforce the value of the series’ tutorials as review tools, as well as adjunct tools alongside anatomy curricula. There is scope for further research into their use as stand-alone resources. Identify abdominal anatomical structures in a variety of medical imaging platforms. Demonstrate comprehension of core abdominal anatomy. Identify some abdominal pathology on medical images. Compare and contrast the different medical imaging modalities presented in the tutorials and demonstrate basic understanding of medical imaging tenets. Apply knowledge of abdominal anatomy to clinical scenarios and/or applications. Medical students traditionally receive their anatomy teaching through textbooks and laboratory classes; however, there has been a recent shift away from didactic approaches towards ones utilizing digital sources,1 including those that draw upon radiologic imaging.2-5 One of the primary reasons for this shift is the current shortage of staff trained in gross anatomy6 combined with data suggesting improved learning using computer-aided instruction (CAI) in medical education.7 However, the desire to better prepare students for the clinical environment,8,9 which utilizes technology in day-to-day activities, remains a primary motivator. A particularly challenging task for medical students is the transition from learning basic science in the classroom to applying this learned knowledge to patient scenarios in clinical practice.10 Having received the majority of teaching in the form of lectures and tutorials, students may then enter unfamiliar territory in hospital placements where they rely on resources such as biochemical testing and radiologic imaging. This explains the push for integrating clinically relevant information from the early years of medical school; in this scenario, students are eased into their transition from classroom to clinic. The benefits of introducing clinical concepts at an early stage have been explored in the fields of anatomy,11,12 histology,13 and neurobiology.14 The purpose of this tutorial is to contribute to the bridging between basic science teaching and clinical applications of medicine. As the latest instalment in our series of medical imaging tutorials,15-17 this educational resource fosters students’ abilities to integrate anatomical principles with radiological imaging and commonly encountered clinical scenarios. Where previous tutorials in the series have been developed for teaching of thoracic, upper limb, and lower limb anatomy,15-17 this work focuses on the challenging and multifaceted abdominal region that is essential in anatomical learning. As with the previously published tutorials in this series, this tutorial aims to broaden the scope of radiologic teaching, assisting early matriculating health care students’ understanding of important anatomical relationships and their ability to apply this knowledge to clinical situations. These objectives are achieved through the teaching of anatomy using medical imaging. This tutorial explores several imaging modalities, including radiographs, computed tomography (CT), and magnetic resonance imaging (MRI). It exposes students to a diverse range of imaging techniques they are likely to encounter in clinical practice while covering abdominal anatomy in sound detail. The tutorial shares similarities to other published resources that endeavor to incorporate radiology into anatomy teaching, such as through team-based learning modules18 and self-guided anatomical atlases.19 It adds to the current literature through its versatility for use in a variety of settings. Although the integration of ultrasound into medical anatomy curricula is an increasing trend,20,21 it was an executive decision to omit this modality from our tutorial due to the complexities of understanding how ultrasound works, an understanding required for its interpretation but beyond the scope of our hour-long review tool. However, the PowerPoint format enabled slides detailing exploration of ultrasonography to be added into the tutorial, allowing its use in a broader range of contexts and permitting not only novice learners but also more experienced students to expand their anatomical knowledge. The research described below investigates the effectiveness of this imaging-based tutorial on medical students’ knowledge of anatomical concepts and their preparedness for using imaging in clinical scenarios, primarily as a review tool for students who have already received standard abdominal anatomy teaching. The tutorial (Appendix A) was a self-directed PowerPoint that guided learners through an overview of abdominal anatomy using a variety of radiologic images. PowerPoint was selected as the most appropriate tutorial program due to the flexibility it provides stakeholders (educators and students), as PowerPoint is compatible with virtually any digital device and allows stakeholders to take charge of their experience by choosing specific content on which to focus. One of the tutorial’s strengths is its flexibility for use in a variety of settings. Once students have access to the PowerPoint file, they can review the tutorial at their own leisure. Although we tested this tutorial specifically on Australian undergraduate medical students after their abdominal anatomy teaching program, the knowledge can be extrapolated to various health sciences anatomy curricula. The tutorial can be adapted for simplification or extended for use in a more comprehensive anatomy program with the removal or addition of PowerPoint slides. The tutorial explored several areas, beginning with an overview of the principles behind radiological imaging, which can be considered in further depth if required. All major areas of the abdomen and gastrointestinal tract were outlined, including the liver and biliary system, small and large intestine, renal system, spleen, and abdominal vasculature. As the tutorial was not developed to serve as a stand-alone anatomy tool, it can be used at any point in the anatomy course, from an introduction to abdominal anatomy to revision for examinations, as well as in group tutorials. Facilitating the tutorial in a group setting would require minimal logistical effort, namely, a projector for students’ collaborative viewing of the resource. Our testing of this tutorial involved a standard tutorial room setup where students brought their own laptops and worked independently over the course of 1 hour. However, several room arrangements would be appropriate for administering the tutorial. Basic room setup could include students seated in small groups, with a projector at the front and a computer for a facilitator to guide progression through the tutorial. Alternatively, students could work on individual computers at their own pace while a facilitator addresses particular anatomical areas using models or specimens. Finally, when the resource is used as a self-directed tutorial, students are able to access it on their own devices at any time, and thus, a formal room setup may be unnecessary as students can run the tutorial at home without a facilitator. Although the pretest and posttest were developed for the purpose of testing effectiveness of the tutorial, they may also be used in anatomy programs to assess students’ knowledge before and after reception of the tutorial. This would encourage discussion amongst students and facilitators to identify areas of abdominal anatomy knowledge that require particular focus. The timing of testing would vary according to facilitators’ arrangements and how many sessions they would require to cover the tutorial in its entirety. Depending on the depth of coverage of each anatomical area and whether facilitators wish to explore the anatomy in greater detail, the tutorial could be delivered in a single session or multiple short teachings. The assessments (tutorial, pretest and posttest quizzes) provide an opportunity for learners to self-assess, giving educators the option to flip the classroom. Based on the length of the PowerPoint and student feedback, we recommend a 1-hour session to move through the PowerPoint. The pretest and posttest (Appendices B & C) administered to students featured multiple-choice questions (MCQs), image identification, and short-answer questions (SAQs). Similar concepts were addressed in both tests, with each question on the pretest matched to a corresponding question on the posttest covering the same learning objectives. The matched questions were not identical, thus reducing the possibility of testing bias. Prior to distribution, the tests were administered to fourth-year medical students, who, being 2 years ahead of test subjects in their studies, had completed all of their core anatomy teaching. This ensured that there were no discrepancies between tests and that any questions with significant discordance were eliminated. An answer guide (Appendix D) was used in marking, with clearly specified answers, so there was consistency amongst markers. Students participated on a voluntary basis, and all information was deidentified, for both the test cases with fourth-year students and on the formal testing day. Participation had no positive or negative influence on academic progress. Students were allocated randomly in a 1:1 ratio to experimental and control groups. A total of 100 students attended the session, meaning 50 were allocated to each group; two invigilators facilitated the session. The control group was given 30 minutes to complete the pretest and then completed the 30-minute posttest immediately after, before being given access to the abdominal anatomy tutorial. Experimental students were given the 30-minute pretest, then were allowed 1 hour to study the tutorial before being given the 30-minute posttest. Study of the tutorial was self-directed, and students were given no didactic teaching or direction for use of the tutorial. All students in both groups ultimately received access to the tutorial to ensure equal access to this learning tool and compliance with ethics. After completion of testing, students in both groups were given an online Likert-scale questionnaire to determine the impact of the tutorial on their knowledge of anatomy and radiology, as well as on their confidence in integrating these principles into their upcoming clinical placement. A two-tailed power analysis was performed prior to testing. Effects of currently published tutorials in the series15-17 were used in estimating an effect size of 0.8, and a significance level of .05. A total of 100 students voluntarily agreed to participate in the study, meaning that 50 students were randomly allocated to the experimental group and 50 to the control group. Based on these figures, an overall power of .977 was calculated for the study, indicating minimal chance of type II error. The Monash University Human Research Ethics Committee approved this study. Test results were compared between the experimental and control groups for both the pretest and posttest, using percentage change and a two-tailed paired t test, due to convention and the differences between the two tests. Analysis was conducted for each question type (MCQ, image identification, and SAQ). Analysis also distinguished direct questions, which assessed information that could be gained completely from the abdominal anatomy tutorial, from indirect questions, which extended beyond the scope of the tutorial and required students to draw on their preexisting anatomical knowledge (from the classroom and the tutorial) and clinical reasoning skills. With regard to direct questions, experimental group students performed significantly (p < .001) better on the posttest compared to the control group by an average of 32.0%. Interestingly, pretest results favored the control group, whose results were on average 3.3% higher, but this result was not statistically significant (p = .75). For indirect questions, a similar phenomenon was observed. On the posttest, the experimental group was superior by an average of 16.0%, but this was not a significant result (p = .22). On the pretest, the control group results were on average greater by 2.8%, but not significantly (p = .85). Separate analysis was performed for each question type to determine which areas of knowledge were most considerably affected by the tutorial. There were no statistically significant differences for either question type, direct or indirect, on the pretest. On the posttest, the experimental group was significantly better on the direct SAQs (t = 0.55, p < .001) and MCQs (t = 3.30, p = .008). It was also superior to the control group on direct image identification questions, but not significantly (t = 1.60, p = .15). 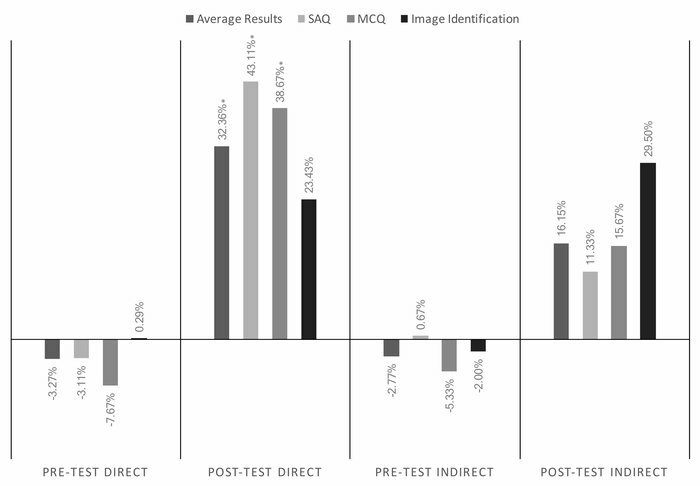 For indirect questions, the experimental group was superior for each question type, but none of the results, SAQ (t = 0.50, p = .65), MCQ (t = 0.48, p = .64), or image identification (t =1.30, p = .25), were statistically significant. The full set of results, in terms of percentage change, is shown in Figure 1.
change for each question type to two decimal places and statistically significant results (p < .05) marked with an asterisk (*). A Likert scale was used for students’ subjective assessment of the tutorial. The results of this assessment showed that the majority of students (57%) considered the tutorial to be somewhat good overall and extremely good as a review tool (52%). Most students felt moderately more comfortable with abdominal anatomy and radiological concepts following completion of the tutorial. Nearly all students found that the 1-hour session gave them sufficient time to complete the tutorial. The full set of responses to all questions is detailed in Figures 2-7.
shows the percentage of students selecting a particular option. popularity of each response as a percentage of all student responses. of the online survey question regarding students’ confidence for undertaking clinical placement following the anatomy tutorial. The proportion of students selecting each response is detailed through bars. the proportion of all students choosing one of these options. In undergraduate medicine, a commonly faced challenge for students is the application of anatomical knowledge learned in the classroom to the clinical environment2,22; one approach to tackling this deficit is to enrich basic science teaching with clinically relevant scenarios.23-25 This tutorial serves to teach core abdominal anatomy through the use of medical imaging, focusing on clinical examples as per previous resources in our series.15-17 It expands the scope of the series by focusing on a new and particularly difficult anatomical region, the abdomen and gastrointestinal tract, while also being tested in a manner different from our previously published work. The selection of PowerPoint as the platform for tutorial delivery enables flexibility for learners to explore different anatomical areas, forms of imaging, and learning objectives at their own pace. It also gives educators the option of selecting particular sections or slides from the tutorial to be administered for teaching, allowing the tutorial to be worked into diverse anatomy curricula without the limitations of a rigid structure. One of the major challenges in tutorial design was formatting the radiological images using the PowerPoint medium, particularly in ensuring that anatomical accuracy was upheld while making the images presentable and engaging to students. Another important decision was structuring the presentation; options here included segmenting according to type of radiological image, anatomical area, or learning style (e.g., structure identification, clinical applications, self-assessment). After experimenting with multiple options, we found that the most logical structure was according to abdominal organs, for example, focusing on the biliary system, stomach and duodenum, and small and large intestine separately in order for students to properly familiarize themselves with each region before moving onward. This tutorial, by contrast to others in the series, was tested as a review tool for students who had already completed the abdominal anatomy section of their medical studies. However, the evaluation process was conducted similarly to our previous work, and in fact, the results did not differ largely. Once again, our research showed that exposure to the tutorial caused a significant improvement in students’ knowledge of anatomical principles and in their familiarity with numerous forms of medical imaging. This resource was tested on students with sound preexisting knowledge in abdominal anatomy, having completed their study of this area, which suggests that this particular tutorial has a benefit that extends beyond the currently taught medical curriculum. This was a finding similar to others evaluating CAI interventions.26 The evaluation process was limited in that the resource was not also tested as a stand-alone anatomical learning tool, meaning its efficacy in this regard cannot be commented on with certainty. Still, it would be likely that a resource that causes knowledge improvement in students familiar with abdominal anatomy would also do so in a group of novice students with minimal prior learning in this area. Another aspect of the testing that highlights the value of this resource is that students’ exposure to the tutorial was self-administered. As the testing showed that students’ knowledge improved when the tutorial was used in this manner, this means it could be used beneficially without need for direct staffing or expert direction. The results suggest that the tutorial could be administered alongside the traditional, structured anatomical study program and still provide significant knowledge benefits without burdening academic time or resources. This finding is significant, given that the literature suggests that cost-benefit analysis must be considered when evaluating and developing CAI resources.27 The tutorial also enables students to study at their own pace, spending time focusing on any particular gaps in knowledge they identify. With regard to tutorial implementation, there were numerous challenges in ensuring that the testing and delivery of the resource to students ran smoothly. As there was a high volume of participants, we had to split them amongst several rooms, and with only two invigilators available, it was difficult to ensure the students all were focusing on the task required (e.g., tutorial, posttest) and not communicating with others. Ensuring each student worked independently was important yet difficult to control, as collaborative learning could have compromised the results and prevented testing the value of the resource as a review tool for individual students. However, the fact that students were eager to work collectively when going through the resource suggests that it is generalizable to group settings, perhaps in small-group teaching at university after delivery of the traditional anatomy course including laboratory work and lectures. The tutorial had a clear positive effect on direct abdominal anatomy knowledge, as the experimental group that received the tutorial beforehand performed significantly better on the posttest than the control group, which had not yet received the tutorial. This result was not observed on the pretest where neither group had yet been exposed to the tutorial. In fact, the control group had superior results, albeit not significantly, on the pretest. This further emphasizes the benefits of the tutorial, as the experimental group with initially poorer scores was able to significantly outperform the control group after receiving the tutorial. However, the testing indicated that this benefit of the tutorial did not extend to indirect clinical scenarios, as there were no statistically significant results favoring the experimental group for any of the indirect question types on the posttest. This is in contrast to our previous work in anatomical regions including the thorax and limbs,15-17 which showed promising results in terms of applied knowledge. One explanation for this discrepancy may be the significantly higher complexity of the abdominal region, especially compared to less complex areas such as the upper limb, where the most significant results were obtained.15 Application of knowledge is highly dependent on spatial and dynamic visualization,28,29 further explaining the disparity in results amongst study of various anatomical areas. Extensive evidence exists surrounding the difficulty in applying learning to clinical contexts,30-32 which is particularly the case for novice learners such as the participants in our study. As previously alluded to, the suitability of our tutorial as a stand-alone learning tool is yet to be tested, limiting its evidence-based use in this manner. The tutorial was designed for use in revision for students with preexisting anatomy knowledge. It is reasonable to conclude that it would be of benefit as an adjunct to traditional teaching methods for novice students; however, the length of the tutorial and the depth to which anatomical principles are covered are unlikely to be adequate to permit students to rely solely on this resource for their abdominal anatomy teaching, nor was that our intention. Further work could expand the concepts in the tutorial so it may be used in a stand-alone capacity. Additionally, a more robust measure of the tutorial’s effectiveness could involve assessing long-term knowledge retention and learner attitudes after students enter the clinical environment and determining if the knowledge gained translates to improvements in clinical reasoning and patient care. Tomic D, Marsland MJ, Lazarus MD, Brian PL. Development and learning impact of abdominopelvic medical imaging tutorial platforms. Poster presented at: ANZACA 2017 Conference; December 4-6, 2017; Auckland, New Zealand. Drake RL. Anatomy education in a changing medical curriculum. Kaibogaku Zasshi. 1999;74(4):487-490. © 2018 Marsland et al.